Sep 02, 2015 in "Morimoto Asia"
Morimoto Asia today announced it will be officially opening its doors on September 30 2015. 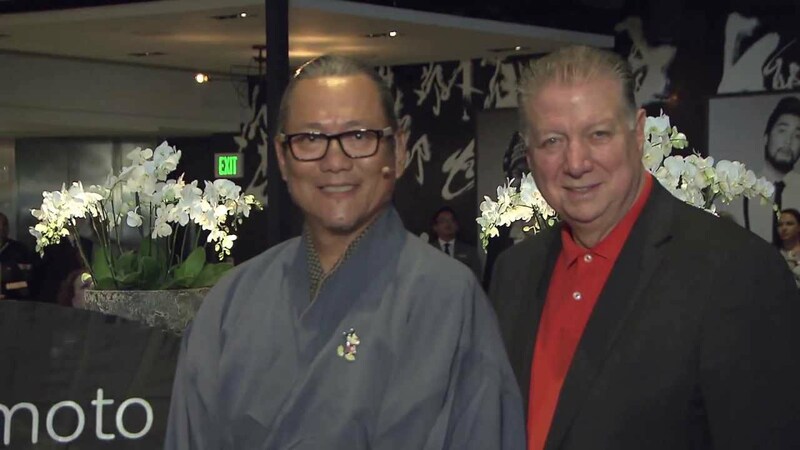 The new pan-Asia restaurant, which is a collaboration between Iron Chef Mesaharu Morimoto and the Patina Restaurant Group, will be one of the centerpieces of the new Disney Springs - a redevelopment of Downtown Disney. Boasting a 36ft tall, two story layout, it includes lounges, dining spaces, and an exhibition kitchen that allows guests a behind-the-scenes glimpse of the culinary action. The second-level sushi bar and lounge have a separate entrance. The restaurant’s main entrance features a three-story glass corner, revealing the dramatic interior design including a multi-level bar and spiraling chandelier made of illuminated glass bottles. The sculptural bar at over 270 feet in length is one of the largest in the world, as it leaps through the soaring 36-foot tall space to connect the grand dining room on the ground floor with the upper level, wrapping around the grand stairway. Custom glass beaded chandeliers evoke the ocean delicacies of Chef Morimoto’s cuisine, and are reflected in antique mirrors, interspersed with glass mosaic artworks based on ancient Japanese prints. Chef Morimoto’s exclusive sushi bar is sculpted from hundreds of pieces of hand-selected ash wood, backed with a wall of hammered copper. Morimoto Asia’s two-story outdoor terrace provides patio seating with sweeping views of Disney Springs. The menu is Chef Morimoto’s eclectic take on his favorite Asian flavors including moo shu pork, Peking duck, lobster chow fun, sweet and sour crispy whole fish, and kung pao chicken. Dim sum will be served during weekend brunch service, and will include a variety of dumplings, shumai, bao, spare ribs and more. The sushi, an intimate 14-seat counter, will offer pristine sushi and sashimi options from around the world. Items include toro, kanpachi, Japanese red snapper, uni, sea eel, hamachi, fluke, and salmon, as well as more ocean delicacies. A variety of specialty sushi rolls and selections from the raw bar will also be offered. While traditional sushi service will be limited to the guests seated at the sushi bar, a selection of specialty rolls and sushi platters will be available to the main restaurant’s diners. Mormimoto Asia promises a destination-worthy line-up. The beers will feature mostly Asian varieties in both bottle and on draft, including the Morimoto signature beer by Rogue Ales. Being a true family-friendly destination, kids will have a variety of Asian-infused dishes including chicken ramen, kakuni pork bao, and karaage fried chicken.